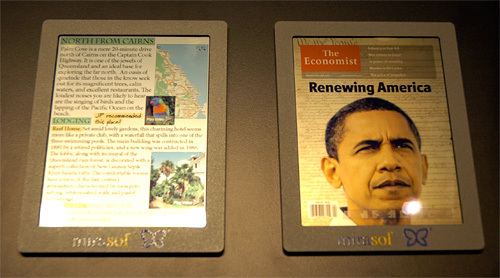 [CES 2010] First Look At Qualcomm's Mirasol Displays | OhGizmo! 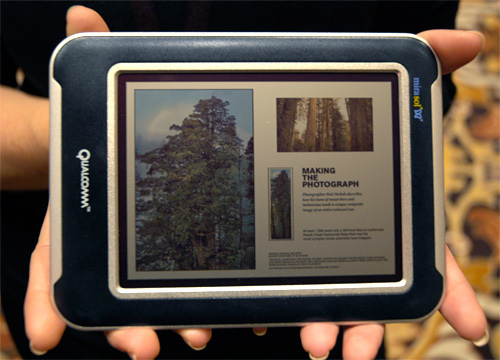 We’ll have more hands-on coverage later in the week, but tonight I managed to get a first glimpse at Qualcomm’s Mirasol display technology, and rest assured, e-book readers are in for a vast improvement. Imagine the extreme readability and battery life of an e-ink display, but with vibrant color and refresh rates fast enough to permit video playback. That’s basically what the Mirasol technology is promising, and based on the demo device they were showing, it will be pretty amazing. The technology itself is based on a reflective technology called IMOD, or Interferometric MODulation, and according to Qualcomm it was developed with inspiration from nature, specifically the iridescent and shimmering wings of a butterfly. But thankfully mother nature never patented the idea, allowing Qualcomm to adapt it for consumer use, which is great for us. OMG The anticipation is too much. I can't wait for these devices to come out. OOO I want to be there so badly.